Wouldn’t it be nice if you could take a step outside your office, or your house, and end up in a tropical paradise? No responsibilities, no stress, just warm sun and a cold drink in your hand. Then, when you’re ready, you can go back inside and continue your life as usual. Unfortunately, here in the real world, that sort of teleportation doesn’t exist. And, more realistically, you can’t just take an exotic trip whenever you want. We all have jobs and responsibilities. But there’s no reason you can’t FEEL like you’re taking a tropical vacation. Even if it’s just for a moment, the ability to take a few minutes for yourself and gather your thoughts. And, if it can have an exotic, tropical feel, that’s even better. That’s why Sodium created Juicy Mango. It’s a full-bodied vape with the exotic, sweet taste of mango, front and center. There are no competing flavors in this blend: it’s just the tasty, mellow experience of a delicious fruit. A dose of mango is just what you need to feel like you’re on a tropical getaway while you’re relaxing at your house. You can leave your worries behind for a moment and revel in the exotic taste. 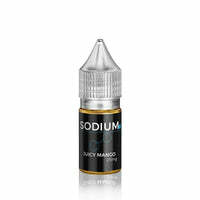 Juicy Mango is the brainchild of Sodium, a brand that has worked hard to put together blends that are full of flavor and full of quality. With top-notch ingredients and perfectly balanced tastes, Sodium flavors are everything you need to enjoy a vacation while still at home. The salt blend includes a high dose of nicotine, so people that are looking for an intense nic experience can get exactly what they want. We can’t transport to a beach just yet (although maybe someday we’ll be able to), but we can have the next best thing with Juicy Mango. Snag a bottle today!